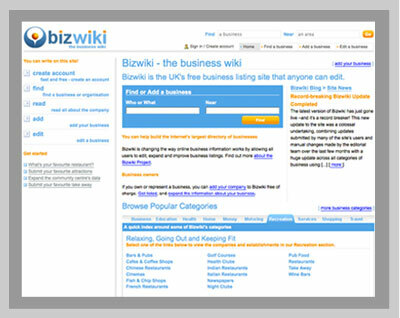 Bizwiki is a free directory of businesses that anyone can contribute to and edit. Bizwiki.co.uk aims to become the largest, most comprehensive directory of British businesses on the Web. There is no cost to add a company to Bizwiki, no on-going charge for businesses appearing on the site. The site and its content are made available for searching to the general population free of charge. Bizwiki is an ongoing project to which almost anybody can contribute. With rare exceptions, Bizwiki listings can be edited by anyone with access to the Internet, just by registering and clicking the 'edit this page' link. It is by users editing and adding to the information on the site that it will grow and improve and become more useful. Guide to the businesses, companies and organisations in the towns and cities of Britain. TownPages is a popular local site with information about the services, clubs, organisations, schools and businesses in towns around the country. The site is free to use, and lists everything from local emergency services to schools, from doctors and sports clubs to plumbers and car parks. Many small towns have been overlooked or have very patchy services available online, and TownPages is dedicated to filling the gaps and offering a helpful guide to communities around the country. US Pages - The best of US business, with detailed information about all of the top American companies. US Pages allows visitors to search for companies by specific industries, read about them, view business and financial summaries, see how their stocks are doing and find contact details for each. Whether you are looking for a list of the Fortune 500 corporations by industry grouping; are simply interested in what makes the biggest corporations in America tick; need to do some background research and find financials; are looking to make a sound investment; or are doing a homework project, US Pages has the information you need. Australian Exporters assists international companies wishing to import goods and services by linking them directly to Australian companies that export. The information portal goes further however by actively encouraging Australian exporters to expand their operations as well as providing guidance, news and resources for Australian companies that are considering whether or not to export. 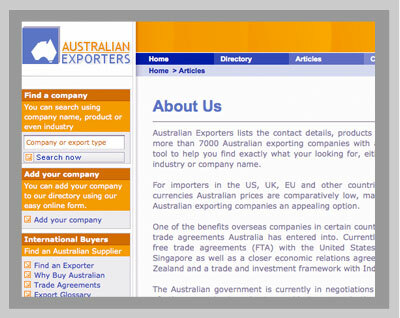 Australian Exporters lists the contact details, products and services of more than 7000 Australian exporting companies with a handy search tool to help you find exactly what your looking for, either by product, industry or company name. For importers in the US, UK, EU and other countries with strong currencies Australian prices are comparatively low, making trade with Australian exporting companies an appealing option. A writer's resource on the web, with vocabulary-expanding word-variation trees, dictionary definitions, lists of commonly misspelled words and more. The online music critic site, with reviews of albums, singles, concerts and live-acts written by music lovers, for music lovers.